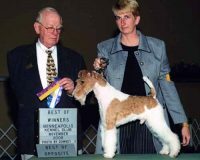 Winner of the most best-in-show awards for good reason, the wire fox terrier may be difficult to train but well worth it for they unique fur and iconic color patterns. When not competing, this breed can be the happiest and most energetic part of your family. And with a lot of attention, this natural hunter turned playmate can be a great guard dog as well. Their original white color and smooth coats made them useful as fox hunters in 18th century England. Needed to drive out prey from their dens, the densely wired hair terrier followed its smooth counterpart a few decades later as hunters realized their rough coat protected them from shrubs. 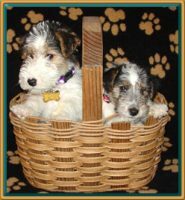 The wire fur was attributed to breading with tan and black terriers, which created the more popular breed we see today. This breed had even more impact as a royal companion in the late 18th and early 19th centuries and later became American movie stars and models in the 1920s and 1930s. This boosted their appeal as a family pet as it showcased their friendly demeanor and trademark coat. As their heritage showed, they work well with people. They offer a playful and active attitude that bodes well with children. However, their intelligence and confidence can lead to difficulty training. Also, their instinct to hunt makes them prone to barking alerting you of potential danger or escaping to catch a threat. Early, constant training is needed to control their energy levels and bad habits. Once you are established as the leader, then this intelligent breed can learn difficult tricks and become your best surveillance system. 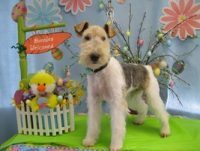 The wire fox terrier should always be monitored when around other animals. Their confidence makes them aggressive even to dogs larger than them. Unless they are raised together, other dogs are a threat. To avoid this, early socialization is necessary. Smaller animals are viewed as prey. 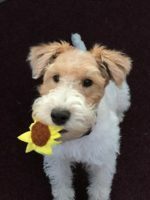 This causes wire fox terriers to chase anything moving at all costs. From jumping over fences to digging escape routes, this breed will stop at nothing to fulfil their duty. 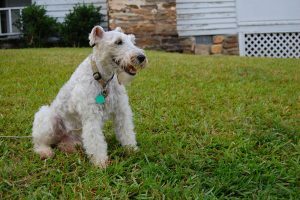 The wire fox terrier’s small, slim stature makes them suitable for small yards and even apartments. An adult malegrows to be about 15.5 inches tall to the shoulders and weighs between 17 and 19 pounds. Females are slightly smaller and weight between 15 and 17 pounds. As a relatively healthy breed, the only initial health concerns should be ensuring the breeder has tested for any generic diseases passed on by the parents. Afterwards, routine health checkups will keep your pet healthy. In some cases, certain diseases may occur in older dogs. Proper nutrition and exercise can prevent some health issues, but others are unpreventable. For instance, it is common for breeds with white fur to become deaf as they age. Cataracts are also frequent. For smaller dogs, hip diseases like dysplasia and legg-perthes disease can occur. Screening can be done if you feel that your dog shows any symptoms of these ailments so that you can help relieve their pain. The normal lifespan for this breed is 13 to 15 years. Like most breeds, feeding them high-quality dog food will ensure he is at his best. Being a high energy purebred, be sure to only fill your dog’s bowl when it is time to eat. Leaving the bowl full will only encourage overeating. Feeding 1.5 to 2 cups twice a day is normal, but the more active your dog is the more food he will require. To make sure you are not overfeeding, check your dog’s weight in between vet visits. You should be able to feel their ribs but not see them. Giving at least 30 to 45 minutes of playtime in the yard or vigorous on-leash exercise should suffice. If energy gets built up, your dog will find other ways to mischievously release the energy. 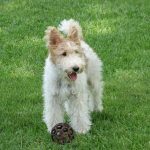 The unique coat of the wire fox terrier should be brushed occasionally and instead of cut, it should be hand stripped. The hairs are wrapped together in a kind of weave so cutting will make them puffy. A professional groomer is best for this technique. Bathing should only be done when your dog gets in a mess. A regular nail trimming is needed when you hear your dog’s nails click on the floor.